You don’t still use a key to open your front door, do you? If you do, let’s get you started on your recovery from the Dark Ages in the right way. In this day of smart technology, there are door locks that will give you secure options on how to get in your house while still keeping your home locked down like Fort Knox. One of them is the Schlage Connect Camelot Touchscreen Deadbolt, possibly the best deadbolt you can find today. As you’ll see from my review, this lock is the epitome of quality and the wave of the future; think George Jetson instead of Fred Flinstone. What is a Touchscreen Deadbolt? 1 What is a Touchscreen Deadbolt? A deadbolt with a touchscreen is ingenious because it adds a layer of protection to a device that at its core is already quite effective. You can program different pins for different users and lets you quickly lock and unlock your door. It also gives you a level of freedom a standard lock and key can’t, as you can enter your home without digging in your purse or pockets for your key. Meets ANSI Grade 1 security standards: The American National Standards Institute has different levels of security, with Grade 1 being the tightest security for a door lock. 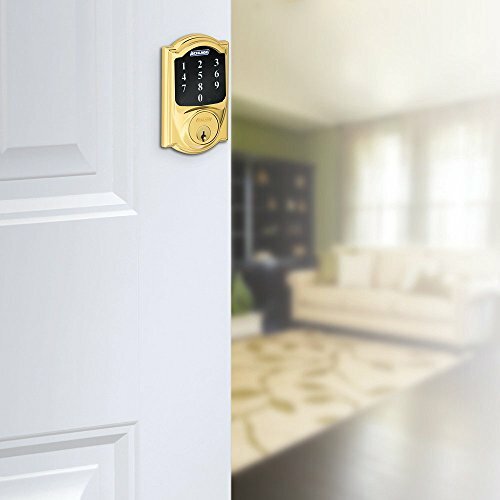 This Schlage product meets this standard, meaning you are getting the most secure fit for your door that you can find. Easy to use: This lock can be opened – by you – in a number of ways. You can choose to use the standard key entry or opt for the touchscreen keypad. With the keypad, you can type in your code and your deadbolt will come undone. For the tech savvy crowd, the lock can even be opened using Z-wave technology and a smart-home hub (sold separately) that can communicate with the web or smartphone to remotely open your lock. State of the art touchscreen: The touchscreen on this lock was engineered specifically with security in mind. The screen won’t carry fingerprints or wear marks. This means that a potential thief can’t see which numbers get punched to open your lock. Your code is undetectable with this touchscreen. Easy installation – The deadbolt interface fits right into where your current deadbolt fits your door. All you need is a screwdriver to install this product. New model includes two keys instead of one – Hey, we all lose our keys every now and then. Thankfully, this new model comes with an extra key, just in case. Anti-picking shielding protecting from lock tampering – The keyhole on this lock features protection from picking. This is just another layer of security that you can get to add to your peace of mind. Multiple unlocking options – With the ability to unlock your door via key, code, or smartphone, you’ll never lock yourself out of your house. This lock is built to keep undesirables out, not you! More expensive than a traditional lock – All of this sweet technology costs a little more than a standard deadbolt. Unfortunately, this is a “get what you pay for” type of situation. However, it is possible to find some Schlage deadbolt discounts with enough searching! Multiple units mean multiple keys – If you choose to use several of these units throughout your house, you will, unfortunately, need to carry a different key for every door. This may take a little bit of the ease of use away from this product. A quick comparison to a competitor, the Yale Key Free Touchscreen Deadbolt, shows how Schlage’s product is a cut above the rest. Schlage’s touchscreen deadbolt offers several different methods for unlocking your door whereas the Yale product only has the touchscreen to unlock the door. Were the touchscreen to prove difficult in any way, you wouldn’t be able to get in your house! Additionally, the design of the Yale deadbolt is not exactly beautiful. However, the Schlage deadbolt can look like a natural part of any house when the right color is chosen. Lastly, the Schlage lock is cheaper than the Yale option, meaning you get more for less with Schlage. Clearly, the Schlage Connect Camelot Touchscreen Deadbolt is the better option here. A: This deadbolt can be easily installed on any door already equipped with a deadbolt. The unit screws into the door on the inside, making installation as easy as a few twists of a screwdriver. However, for doors that do not already have a deadbolt on them, a bit of carpentry work is involved in prepping your door for mounting, as would be needed for any other deadbolt. Q: What’s the difference between the 468 and 469 model? A: The 468 model comes with an extra key and the keypad has an improved screen for extra security. Additionally, the 468 model has more adaptability with third party hubs. Q: Does this deadbolt work with Alexa? A: Yes! Amazon’s Alexa is a Z-wave device that operates with this smart deadbolt. Many other devices that communicate through Z waves will work with this lock, too. Reviews of this product are nothing short of outstanding. Those who provided feedback noted how easy the installation of this product was, sliding easily into their existing deadbolt housing. Reviewers also noted how easily the Z-wave technology connected them with the hub of their choice. 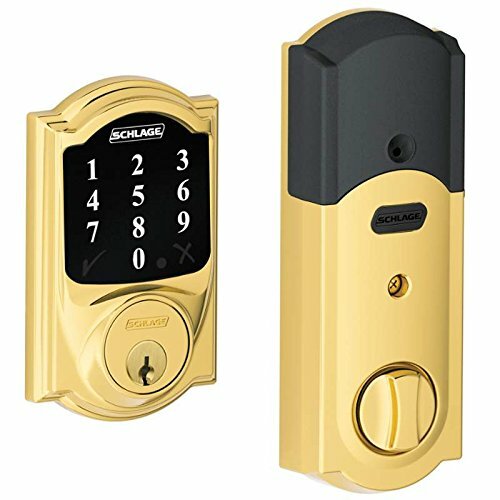 Getting technology to communicate can be difficult (especially across different manufacturers) but it appears that Schlage truly made sure that their locks connect well to other devices. All told, this Schlage product provides a great opportunity to add security to your house in a smart way. It gives you a few different ways to open your front door from the old school key to the new school smart lock technology option. With the highest grade for residential locks on its resumѐ, this lock is sure to keep the bad guys out and keep your house and family safe. For the smartest deadbolt option on the market, choose the Schlage Connect Camelot Touchscreen Deadbolt. The Amazon Echo 2nd Generation vs Echo Dot: 2 Life Changing Products - Which Echo is Better?